These helpful little items will make your life just a little bit easier for the year ahead. By now you might have all the technology you need for the upcoming school year. You've got your laptop, you've got your portable storage drive, and you've got all the other gadgets you need. But there's always something you've forgotten, or there's always something that'll make your life a little easier, even though you didn't realize it. Below you'll find backpacks, cables, and other handy items that you might have overlooked while preparing to go back to school. You don’t get much better than Anker when it comes to external battery chargers. The PowerCore 20100 portable charger has a massive 20100 mAh capacity (which will charge an iPhone nearly eight times over), has a maximum charging speed of 4.8A, and has two USB charging ports. It’ll identify what kind of device you’ve attached to it, and provide a charge tailored to that. It measures 6.5 x 2.3 x 0.9 inches, and weighs 12.6 oz, which Anker handily points out is about the same as a can of soda. The PowerCore 20100 also had surge and short circuit protection, as well as a couple of other features to keep your devices safe. It’ll take a while to charge back up after you’ve used it for an extended period of time, but it’s worth it considering it can be a (battery) life saver in a tough spot. Anker is back at it again with this 60W / 12A USB charger. Plug this into the mains and thanks to its 6 USB ports you’ll have plenty of space to charge all of your equipment. Anker even does a 10 slot version if you’ve got a crazy amount of hardware you need to charge all day long. For the rest of us though, a 6-port will be more than enough, and you can even downgrade to 5, 4, 2, or just 1 slot if that’s all you need. Not 3 though, that would be crazy. Anker’s 6-port plug is nice and compact, measuring 3.9 x 2.8 x 1 inches and weighing 9.4 oz (slightly bigger or smaller based on how many ports you choose, of course). It’s discreet too, with no crazy designs or branding. You can simply choose between white or black, based on what will work best with the rest of your tech. This one also comes with a 18-month warranty, so you’re covered for a while. 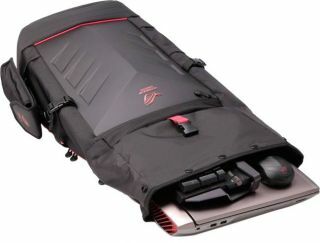 Asus recently added the ROG Ranger backpack to its range, and it’s a huge bag which will fit a 17-inch laptop, plus multiple accessories. It’s durable, and it’ll even keep everything dry in the rain, thanks to its water-resistant 1260D Gucci polyester with a polyurethane panel on the back. Plus, if it’s really pouring down, there’s a built in rain cover that you can stow in the bottom of the bag. Asus is so proud of the ROG Ranger, there’s a trailer for it. In the video you’ll see the bag being filled with a big laptop, external power brick, keyboard, mouse, mousepad, headphones, and a smartphone with ease. There’s also an integrated security lock so your precious equipment isn’t just safe from the elements, it’ll be tough for thieves to get at as well. It measures 35 x 51 cm, and with nothing in it, the backpack weighs 1.6 kg. It certainly looks like a gamer’s bag with its aggressive, angular design, but it’s not too ostentatious, with only a splash of color here and there. The AmazonBasics Laptop Bag isn’t going to win any awards for design, or how much you can fit into it, or how durable it is. But if you just want a case which will carry your laptop from place to place, you can’t really go wrong for this price. There are options available to you for whatever size laptop (or tablet, for that matter) you have. There’s one for a 7-10 inch, an 11.6-inch, a 14-inch, a 15.6-inch, and a 17.3-inch. Even the biggest one is only $17, and you’ll be paying under $10 if you just want a little carry case for your tablet. It’s not very stylish though, and the AmazonBasics logo found on the front might not exactly be something you’ll carry around proudly. Still, it’s cheap, and there are a couple of extra pockets to put some small accessories in. The 17.3-inch version weighs only just over a pound, so it’s nice and light and won’t add too much weight to your laptop. Sometimes, basic is all you need. The NoLita II is a handy little case for your laptop. It’ll accommodate up to 16-inches, and it’s made of lightweight neoprene, weighing under 2 pounds with nothing else in it. The nice thing about it is the sleeve, which slides out nicely and has straps keeping all of your equipment in place. If you’ve got a smaller laptop or a tablet, there’s a smaller NoLita II available too, accommodating up to 10.2-inches. The so-called Grid-It organization system is made of rubberized woven elastic, and you’ll be able to easily fit a smartphone, a small-ish laptop charger, some earphones, and a couple of other small items in there. Plus, when you slide it out, the back of it doubles as a mousepad, which can be handy when you’re out and about. However, a mouse is probably something you won’t have space for, because the NoLita II is pretty slim. As for the style, it’s pretty basic, and comes in gray and black, or a bright red, if you want to show it off a bit more. Not everyone’s laptop needs an extra cooling solution, but if yours is built for gaming as well as for work, you might want to consider investing in a laptop cooling stand. The Havit HV-F2056 is a good little cooler which pushes a decent amount of air around your laptop, but its main selling point is the portability. It has a simple design, it’s slim, and it’s lightweight, so you’ll be able to carry it around with your laptop without too much hassle. The Havit measures 14.96 x 11.02 x 1.1 inches, and it’s designed for laptops between 15.6 - 17 inches. It’s USB powered, and has three quiet fans which push air around at a good rate. However there are more powerful cooling stand options available, if you’re willing to spend a little more and have a heavier product. The Havit has a couple of height settings, but it won’t be lifting your laptop too far up off the table. It has a simple, rectangular design, with some nice blue lighting for the fans. There are far crazier designs out there if you’re looking to show off your laptop stand, but there’s not a great deal of point when it’s going to be covered by your laptop 90 percent of the time. If you’re out and about, it can always be helpful to have an extra HDMI cable to hand. You might need to plug your laptop into a bigger display for a presentation, or maybe you just want an extra monitor for whatever you’re doing. You can get super expensive HDMI cables, but you won’t notice any difference in quality, so just go for value here. Of course, you’ll have to factor length in, so bear in mind what you’re going to be using the HDMI cable for. Mostly, AmazonBasics will give you the most cost effective solution, although the range of lengths isn’t the highest out there. Still, the range goes up to 25 feet, which will be more than enough for most people. We're also big fans of getting our cables form Monoprice.com. The company is known for producing high-quality cables and selling them at very attractive price-points. If you can't find what you're looking for on Amazon.com, check out Monoprice.com. Another useful item to have in your laptop bag is a USB extension cable. Perhaps you’ll need to give some extra reach to your keyboard or mouse, or have a gadget over the other side of the room to where your laptop is stationed. Again, much like the HDMI cables above, you’re better off just going for value for money here. AmazonBasics wins the price war once again, and they’ll give you a range of 3.3-feet up to 9.8-feet. Even with the most highest length you’re still only paying a little over $5, so you won’t be breaking the bank either way. Nothing too fancy here, just a handy 16 oz bottle of LCD screen cleaner and a microfiber cloth so you don’t scratch up your screen while cleaning it. This particular screen cleaner is apparently designed to clean fingerprints, so it will be extra useful if you’re using it for a touch screen device. But it’ll work fine on TVs, laptops, phones, anything really. The cleaning kit from Bryson Industries is cheap and is very highly rated by customers. If you’re taking your laptop out into public places, it’s never a good idea to leave it alone. If you absolutely have to, even for just a minute or two, you’re probably going to want a cable lock to ward off any potential thieves. Not only does the Kensington Combination Cable Lock have a nice thick, woven carbon steel cable to give cutting tools a hard time, the lock itself has a combination, as the name suggests. Simply put in your four digit combination, and it’ll pop open, and it’ll snap back in with one hand to the Kensington Security Slot (K-Slot). Kensington owns the industry standard physical theft prevention slot, and you’ll find it on most laptops. The Kensington Combination Cable Lock comes in a standard size, or you can pay about $10 more for a thicker cable, if you’re really worried about tools being used to cut your laptop away from the desk. The Anker Astro E5 is an alternative portable charging solution which will keep a couple of devices going for a few days without having to charge them at the mains. The latest edition has bumped the capacity up to 16000 mAh, and the micro-USB input up to 10W, while also becoming a little slimmer so it’ll fit in your pocket nicely. Anker says the Astro E5 will charge an iPad Air more than once, and a Galaxy S5 four times. It has two USB outputs, so you can be charging two devices at the same time, and one micro USB input. It’ll take you around 8-9 hours to recharge it up to full capacity, so it’s advisable to plug it in overnight if you’re going to use it the next day. The Astro E5 comes with an 18-month warranty too, which is handy.